It’s hard to explain to those who weren’t around during the 1970’s just how big the PLANET OF THE APES franchise was. Trust me, it was huge. There were the five original movies, a live action televison show and a Saturday morning animated series. Marvel Comics had a black-and-white “Planet of The Apes” magazine that ran for about five years and since then about a dozen different comic book publishers have produced mini-series, ongoing series or one-shots based on or spinning off of the films. Tim Burton tried to relaunch the series with his 2001 remake. The less said about that, the better. Fortunately, RISE OF THE PLANET OF THE APES is a movie that’s a lot more in tune with the spirit of the 1968 original. The major problem with Tim Burton’s movie was that it tried to be a blockbuster action picture. Maybe if it had been directed by an action director, it might have worked. Brilliant as he is, Tim Burton simply cannot direct action well. 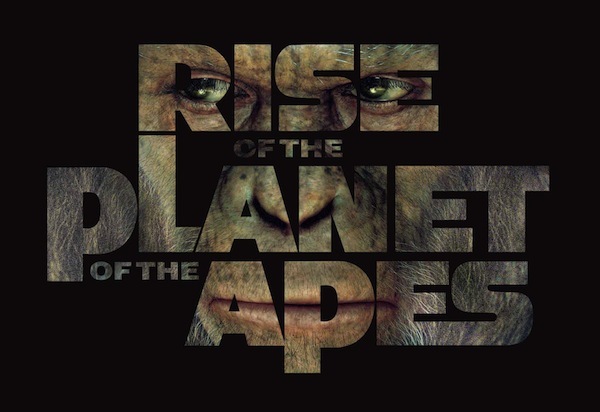 RISE OF THE PLANET OF THE APES worked for me because it’s not an action movie pretending to be science fiction. It’s a legitimate science fiction movie that takes it’s time to explore the time-honored theme of man monkeying around (sorry, couldn’t resist) with nature and playing God. As Dr. Frankenstein can testify to, that trick never works. Dr. Will Rodman (James Franco) is the star research scientist at Gen-Syn where he’s spent the last five years working on ALZ. It’s a genetically engineered retrovirus that may be the cure for Alzheimer’s. Much to Will’s surprise it has also significantly boosted the intelligence of the chimpanzees he’s been using as guinea pigs. However, due to unexpected side effects, the project is deemed a failure and the chimps have to be destroyed. 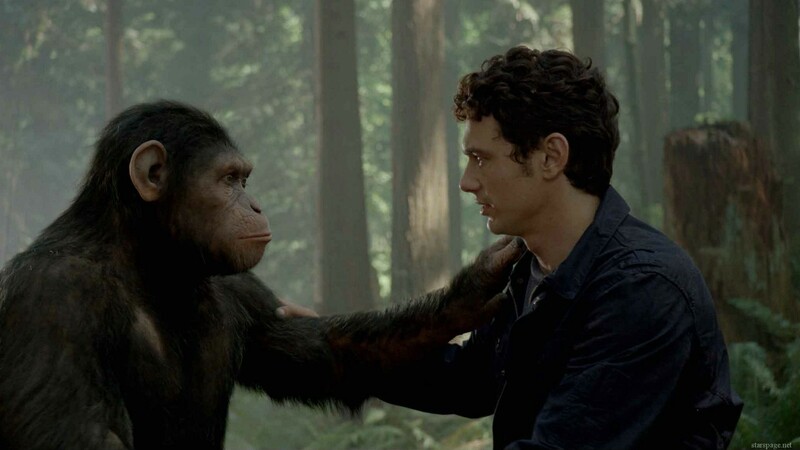 A baby chimp is saved, however and Will takes it home, giving him the name Caesar (Andy Serkis). Will raises the chimp, which soon displays human-level intelligence. Will also treats his father Charles (John Lithgow) at home with ALZ, continuing his research on both of them. Caesar can carry on conversations with Will through sign language and plays chess with Charles. Due to his private at home research; Will is able to get his project re-funded, this time with an improved, even more powerful version of ALZ. But due to a tragedy, Caesar is taken from him and incarcerated in a privately owned primate sanctuary run by John Landon (Brian Cox) and his son Dodge (Tom Felton) who delights in sadistically abusing the primates. It is here that Caesar gets a crash course in how his kind is actually treated as he’s always lived with humans and therefore never had to live…well, as a monkey. But Caesar is a really fast learner and with the help of his new friends; the orangutan Maurice, the gorilla Buck, a whole lot of pissed off primates and a generous supply of ALZ, he intends to change things. RISE OF THE PLANET OF THE APES reminded me of “Batman Begins” and the 2009 “Star Trek” in that it’s not a remake, sequel or prequel to any existing “Apes” movie but a legitimate restart that takes the best elements of what has gone before and reshaped them into a new form for today’s more sophisticated audiences. There’s enough homages and winks at the original movies that if you get them, you’ll appreciate them as I did. But you don’t get them, that’s okay as well. There’s even an unexpected “Godfather” homage in there that had myself and most of the audience I saw it with howling with laughter for about a minute. The acting isn’t anything to rave about, except for the performance of Andy Serkis as Caesar. While I never understood the appeal of his Gollum in “The Lord of The Rings” (to be honest, I understand very little about anything having to do with LoTR) I greatly enjoyed him here. Considering his role is 99% non-verbal and he has to communicate what Caesar is thinking and feeling with only his eyes, face and body language, I was throughly immersed in his performance. As for the rest of the cast…well, the human actors do their thing but there’s not much in the way of deep characterization here so don’t look for it. Fans of “Stargate Atlantis” will be happy to see David Hewlett show up in a small but pivotal role. As for the CGI apes, gorillas, baboons, orangutans and chimps…I know there’s a whole lot of folks who are going to pick apart the CGI saying it looks ‘fake’ or ‘phony’ but you won’t find me among them. I mean, it’s not like the apes in the other movies were real, either. The CGI served the needs of the story and that’s all I ask for. What really surprised me is that there was a lot less violence in the movie than I thought there would be, judging from the trailers I saw. 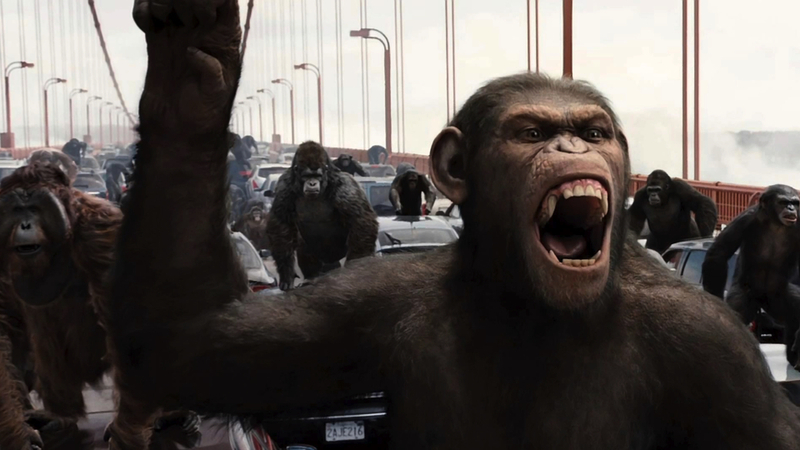 The battle between the apes and police on The Golden Gate Bridge could have been a lot gorier and bloodier but it isn’t and I appreciated the restraint on the part of the director because RISE OF THE PLANET OF THE APES isn’t that kind of movie. I bought this film, and the 2 sequels — sight unseen. I’d heard to many good things about them. I could not stay away. (I was a bit shy at first, because of Burton’s failed attempt; and you’re right: he’s not an action director. Great make-up and setting though.) This film is a true drama, a drama on a human level. It’s emotional without being maudlin. Performances are outstanding, as is the motion capture/CGI. The virus is nicely set up and plays out through the next 2 films, and explains why the humans in the 1968 version couldn’t speak. These films were planned out in advance. These were not rushed into production to cash in on success, I feel: there is a clear arc that follows through like a well-written novel. Just simple, clear, brilliant film making and story telling. It’s character-driven, and without that, all you have is just images and words on a piece of paper. As usual, a thoughtful and informative review. I’m actually looking forward to seeing this now. Just not my cup of tea, amigo. Save for the original Charlton Heston flick, I could never get into the sequels or other tons of connected material. Watching the trailers for this one left me cold and I’m taking a pass. Though I do appreciate it has apparently entertained you and many, many of pals and that’s a nice thing for sure. Nope, for me it’s bring on the new Three Musketeers with the AIRSHIPS!!!! I can’t wait for the new THREE MUSKETEERS!